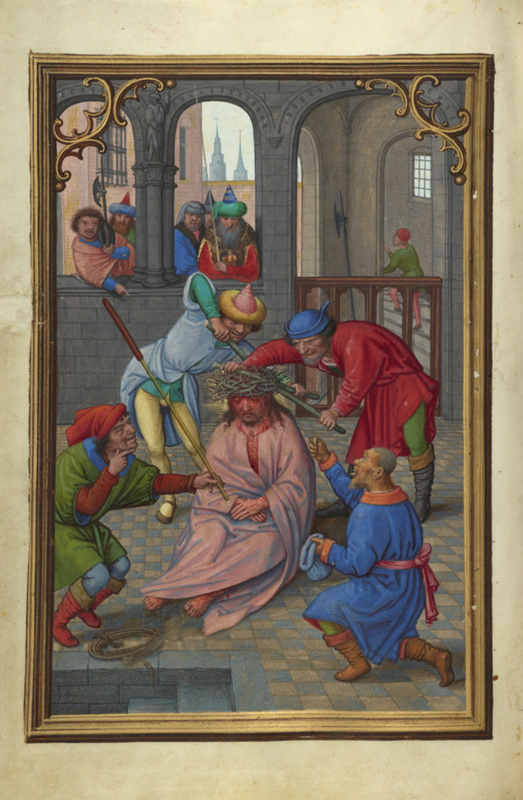 Simon Bening placed Christ in the center of this miniature in a pose that reveals dignity and grace in the face of his attackers. Despite the grievous wounds he has sustained, Christ retains a solemn beauty while his tormenters appear ugly, foolish, and evil. In juxtaposing the distorted features of the henchmen with Christ's comely figure, Bening followed a common medieval artistic tradition meant to evoke a sympathetic response from the beholder. He also drew the viewer into the scene by placing Pilate and his retinue outside the windows of the torture chamber. In a sense, the officials mirror the position of the person looking at the picture.